We all know the saying “Work smart, not hard.” Unfortunately far too few business owners actually figure out the magic formula to achieve this truism. The truth is it’s actually fairly simple to make your hours on the job earn you more – start outsourcing accounting work. Number crunching doesn’t move your firm forwards. Doing the basic accounting work of your firm is necessary of course, but it is also probably the least productive way for the big boss to spend his or her hours. Number crunching keeps your firm where it is, but it doesn’t really help with growth. 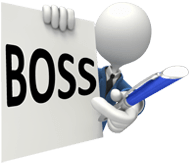 As the boss the vast majority of your time should be focused on your firm’s growth. You should be spending time with your clients, figuring out your value-adds, keeping track of your competition, and planning your next big venture. If you spend all of your time doing the trench work your firm will not expand due to the simple fact that nobody is spending time planning its growth. By outsourcing accounting work you’re able to focus your big boss brain on where it needs to be – the evolution of your firm. A timecard is not a measure of your value. It’s a mistake to think that success lies in racking up the hours worked per day. It’s not a matter of how many hours you work but rather how productive you are in any given hour. This is perhaps best illustrated by the concept of competing on price. If you lower your price to compete you’re going to have to work more hours both in doing the actual accounting as well as hustling for new clients in order to make the same amount of money your competition can make in a single hour. But if you start outsourcing accounting work you’ll be able to give your firm more value for every hour that you work. Your efforts will largely be geared towards improving your firm, which will bring in more A-list clients at higher rates, meaning your value per hour will increase again. Putting work in the hands of others can be nerve-racking, especially when you have been a one man or woman show up to that point. You may feel that nobody can maintain your level of quality of your “special touch” that has become your brand. However doing everything yourself means that you’re not getting anything done towards achieving the goal of owning your own business – gaining financial and personal freedom. You won’t be achieving either if you’re spending all of your time doing the most basic tasks and you’re spending no time on improving your firm. Outsourcing accounting work is an incredibly easy step that immediately achieves one of those goals – personal freedom. You won’t be a slave to tax season due dates or monthly bookkeeping chores done on behalf of multiple clients. In one simple move you’ll have gifted yourself with one of the major goals that drove you to open your own shop in the first place. Break big goals down into easily achievable milestones. Finally, don’t let enormous goals stress you out. Instead, take a moment to break them down into much smaller milestones that can be achieved on a monthly, weekly, or daily basis. This goes for both the big-picture goals you set for your firm and for work being done on behalf of a client.